St Denis is one of those streets that has tons of tucked away places that you may pass in front of dozens of times but only on the 13th time do you realize that a restaurant is actually situated there. 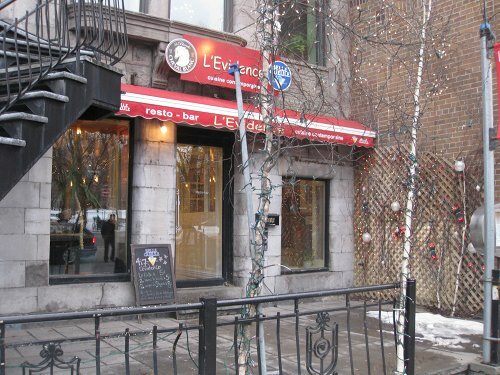 That’s the case with L’evidence: I have passed by it for years and only when I met up with my friend and we decided to go for brunch at a new place was I introduced to L’evidence. My friend had known of this places for a while and me… well lets say I have eaten at all the restaurants north, south, east and west of it, but I never knew they did brunch. So, after I got my eyes checked, we went in and checked out what makes this place so special. With breakfast being served all week long from 8 am until 4p.m. (official site says 3 but they said 4 when I asked), you can stroll in whenever you want and depending on if you go at peak hours you may see a lineup there. When you walk into L’evidence, you enter this whole different world. Almost like traveling back in time to a place long ago. The interior is a mix of “diner meets old bistro.” With it’s chess board black and white tiles, its chandeliers and large bar, this place is definitely different from other breakfast joints out there. The place is quite large with another adjacent dining room and can easily hold well over 50 people. There is also space outside for a terrace and when the weather is better it makes for a nice spot to chill and do some people watching. 3 fruit plate options ($6.95-$9.95). 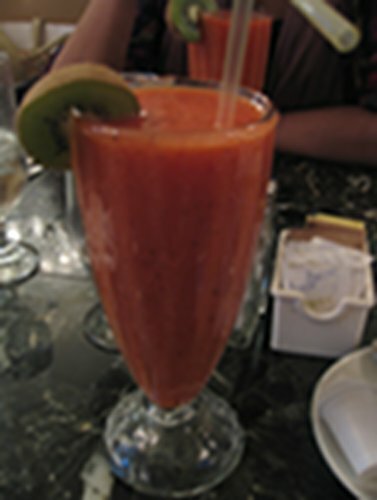 I started off with a large fruit cocktail ($3.95) with peach strawberry as well as other berries. The subtle taste of peach made me down it like a cold drink on a hot summer day; it went down fast and there was hardly a drop left. This is a great option since you get an amazing tasting drink for a very reasonable price. I have been to other places that charge $5 and more for a drink not nearly half as good so when I get a chance to have a great tasting drink at an affordable price I am all over that. 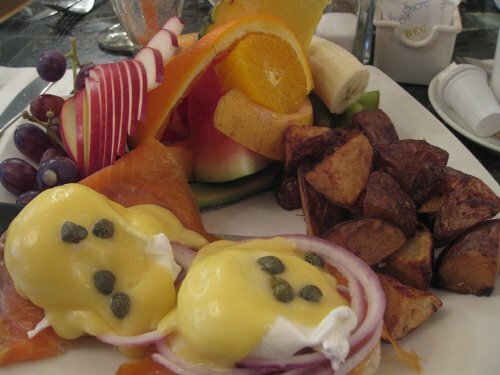 We started off with the Arc en Ciel ($11.25) eggs Benedict and smoked salmon dish. The dish came with a mountain of fruit on the side, as well as potatoes. The smoked salmon was tasty and fresh, the hollandaise sauce was rich and generous and the eggs were poached to perfection; although, I felt there was a little too much red onion on the dish. The fruit was incredibly fresh, bursting with flavour and really well presented with apples sliced nicely and orange peeled to give you a masterpiece on your plate. Lastly, we had the apple cheddar crepe ($8.50) which was served stuffed with a warm apple and cheddar and a slice of baked apple on top. 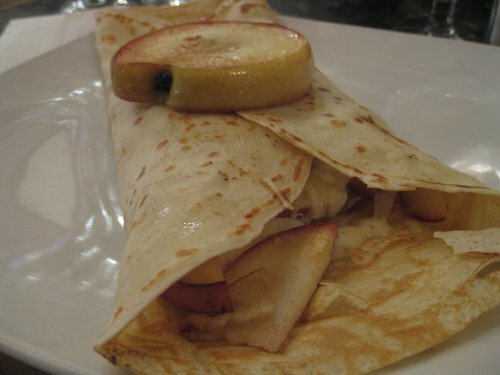 The crepe was quite filling and there was a generous amount of apple. My only criticism is that I would have used a stronger cheddar. I felt it lacked that punch that a nice orange cheddar has. Cheddar and apple is one of my favourite pairings but the cheddar needs to be pronounced to offset the sweetness of the apple. I also would have liked to have some accompaniment on the plate like maybe a little bit of fruit or potatoes. I guess it’s because it was a large plate and the crepe looked all alone without any accompaniment. Service was good; our coffee was refilled the bill came on time. We didn’t have too much interaction with our waitress but we were satisfied. There are many vegetarian plates as well as some healthy options, and not to mention three fruit plates that can qualify as vegan. In fact, more than half of the menu is vegetarian friendly so this gives you lots of choice, which other places don’t have when it comes to vegetarian friendly dishes.